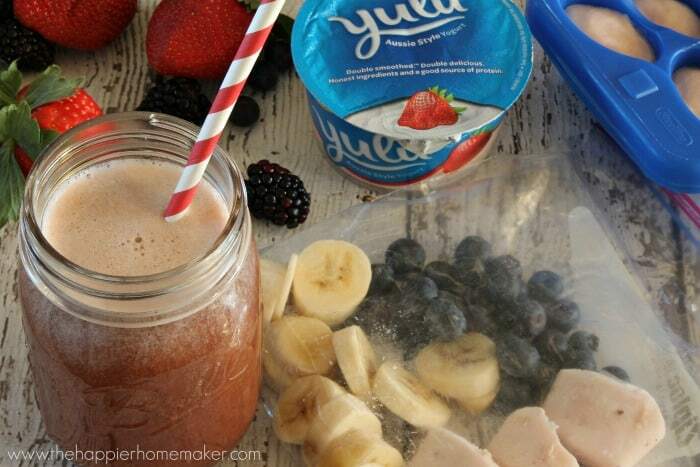 I love having smoothies for breakfast or snacks-they are easy to make and an easy way to enjoy my daily dose of yogurt plus sneak extra fruits and veggies into my diet! 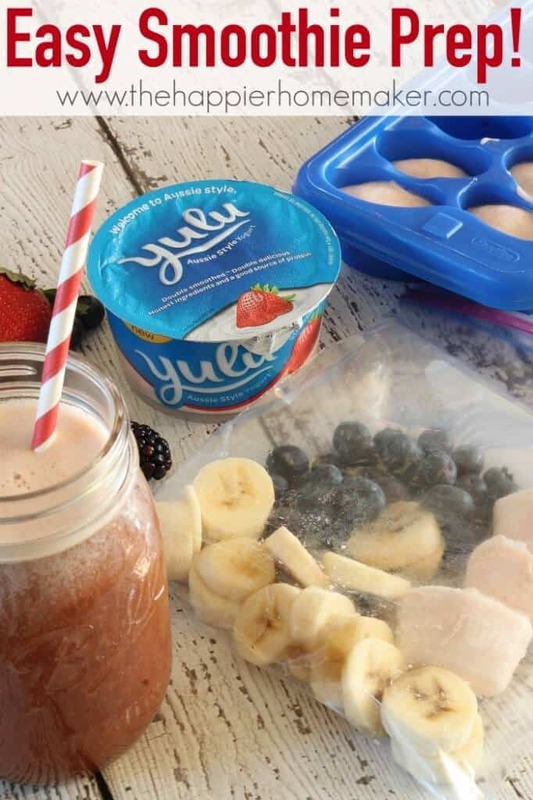 When my boys started school a few years ago (before we started to homeschool) I came up with a really easy way to make my morning smoothies even easier in the hustle and bustle of busy mornings trying to get three kids out the door-pre-made smoothie packs! I thought I’d share a few of my favorite versions with you today in case anyone else could use a few extra minutes in the mornings but still wants a healthy yogurt smoothie for breakfast! The key to the smoothie packs are pre-slicing your fruits (and veggies if you add them) and having yogurt frozen ahead of time so you can simply dump the bag in the blender, top off with juice or almond milk or the beverage of your choice, then blend. 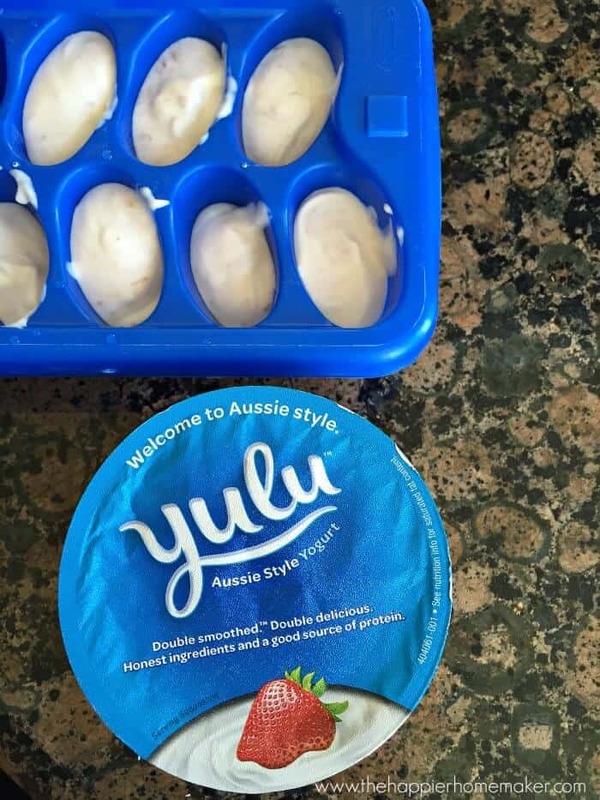 I used the strawberry flavored yogurt, frozen ahead of time in an ice cube tray, to make this tasty Banana Berry Smoothie! 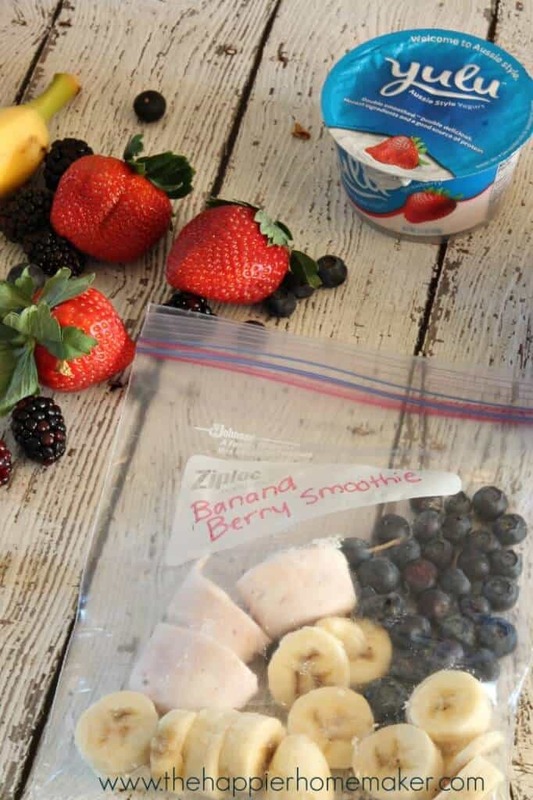 Add all ingredients to a plastic baggie and freeze thoroughly. When ready to prepare, add to blender and fill to 8 oz with apple juice, coconut water, or almond milk. Blend until smooth. I love making smoothies this way because the end result is significantly more creamy than adding ice to room temperature or refrigerated ingredients. For more smoothie inspiration you can check out my Chocolate Almond Skinny Smoothie, Cake Batter Smoothie, or Mango Blueberry Green Smoothie Recipes!